I'm so excited to share with you the summer style challenge I did with Offers.com. The challenge was to style an entire outfit with only $100, using the coupons and discount codes offered on their site. It was so much fun discovering all the different specials that I had no idea was out there and much to my surprise, I ended up spending less than $100 on this outfit! Can you believe it? For the challenge I went with a summer favorite of mine, the black and white trend. I opted for classic pieces that added interest with the minor details; like these black and white braided ankle strap heels and laser cut out scallop shorts. Its the little details that bring it to life! Also check out how the other bloggers styled their summer challenge looks over here. chic in black and white! Voted! 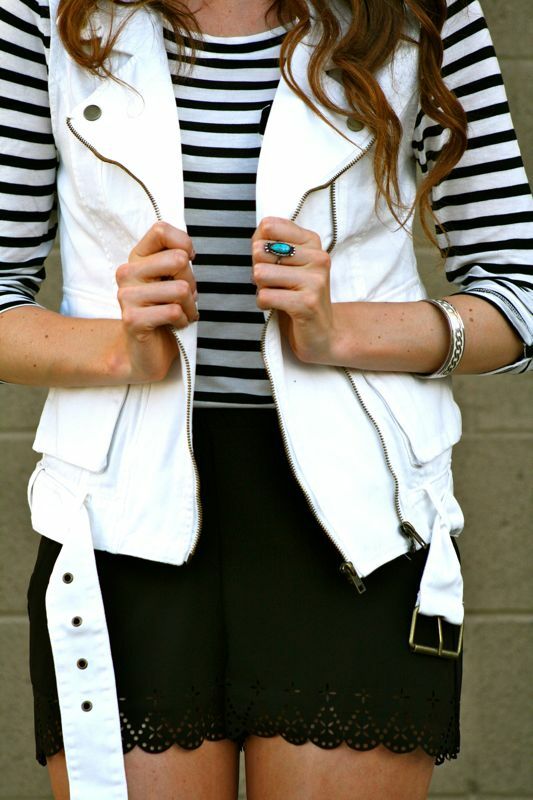 Love the whole look especially the vest & shoes! This is so gorgeous! I love the whole ensemble. Those heels are amazing. Just found your blog and love it! New follower!